Peach Wars: Southern States Spar Over Which Has The Most Juice Which state really deserves the title of Peach State? The departments of agriculture in Georgia and South Carolina squared off on Twitter this week. South Carolina's Department of Agriculture claimed on Twitter this week that the state harvests three times more peaches than Georgia does. Numbers say otherwise. It's a juicy rivalry complete with peach emoji and a well-timed "bless your heart." The agriculture departments in Georgia and South Carolina sparred on Twitter this week over which of them really deserves the title of Peach State. It started with a tweet from South Carolina's Department of Agriculture — an account off to a feisty start since it was created in June. The department claimed that South Carolina harvests three times more peaches than Georgia does. Georgia's Department of Agriculture shot back, "We say ours are 3 X SWEETER." South Carolina replied with just three loaded words: "Bless your heart." The U.S. Department of Agriculture just released its most recent peach-production numbers. And here's the thing: Neither state produces the most peaches in the nation. That crown goes to California, a state whose Food and Agriculture Department kept its Twitter activity this week to healthy soil, water efficiency and recent fires. The USDA numbers also show that South Carolina does not, in fact, harvest three times more peaches than Georgia. The Palmetto State harvested just slightly more peaches than did Georgia in 2017, and production in both states was down last year from 2016, because of an early bloom and a spring freeze. The harvest was so slim across the South last year that New Jersey, Pennsylvania and Washington state all produced more peaches than either South Carolina or Georgia. Southern peach production has fluctuated in the past decade, and most years, South Carolina has produced about twice Georgia's peach crop — but never quite three times that of its neighbor. Sally McKay, a representative from South Carolina's Department of Agriculture, said the state often uses truck shipments when measuring peach production, which explains what might otherwise seem to be fuzzy math. For its part, Georgia still considers itself #blessed to be the Peach State. After all, it's the home of the World's Largest Peach Cobbler — baked each year at the Georgia Peach Festival in Peach County. "Just as gold is the standard for currency, and Vidalias are the standard for sweet onions ... we feel that our rich heritage and longstanding research efforts with our land-grant universities, makes sweet Georgia peaches the benchmark that others strive for," Georgia Agriculture Commissioner Gary W. Black told NPR via email. 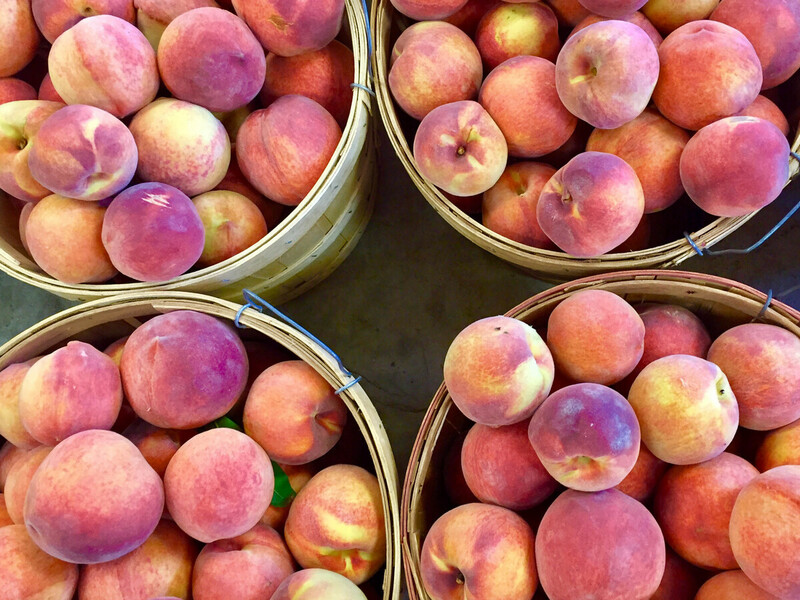 On Friday, the states challenged each other to a friendly #PeachOff, urging people to take peach pit-stops at local stands and support local farmers to decide which state is tops. "The truth is, Georgia's not far away," said McKay in South Carolina. "We encourage folks to eat peaches from the South." She said the Twitter competition might just lead to a blind taste test between agriculture commissioners of each state. They both have a peach of our heart, bless 'em.